Until the early 1980s, nearly all bikes for adults had 72 spokes total -- 32 on the front wheel and 40 on the rear for English bikes, or 36 on each wheel for other countries. Only very expensive racing wheels used 32 spokes. In the 1980s, manufacturers began marketing 32-spoke wheels as more technologically sophisticated, although the wheels were often weaker. The 24-spoke wheels are a continuation of the trend toward lower spoke counts. The 32-spoke wheels are found on a variety of bicycles, from road bikes to mountain bikes and comfort bikes. The wheel design differs between bikes and manufacturers. The 24-spoke wheels are often found on racing bikes, fixed-gear bikes and trendy bikes. Such bikes don't experience as much weight or as many intense impacts as mountain or hybrid bikes, so they don't need to be as strong. Wheels with fewer spokes don't necessarily weigh less. The rims must be heavier to maintain the wheels' strength due to the greater distance between spokes. Any perceived benefit in a lower spoke count is due to engineering, not the number of spokes. Changes in rim design, spoke design and materials used may affect wheel weight. Wheels may use steel, aluminum, titanium or carbon fiber spokes; steel wheels are the heaviest and carbon fiber are the lightest. Some cyclists prefer wheels with fewer spokes, believing that the 24-spoke wheel has better aerodynamics. More spokes may mean more points of resistance against the wind. However, spoke count affects the aerodynamic function of a wheel by only 10 percent. The depth and shape of the rim, on the other hand, contribute 80 percent of the aerodynamic quality of the wheel. The spokes on a 24-spoke wheel have a greater tension than the spokes on a 32-spoke wheel, because they are under a higher load. As a result, if one spoke breaks or weakens, the other spokes have a proportionally higher load. Individuals who are particularly heavy or who haul heavy loads for errands, touring or other purposes should use neither 32-spoke wheels nor 24-spoke wheels; they should use the stronger 36-spoke wheels. Tandem bicycles need at least 36 spokes per wheel, and usually have 40 to 48 spokes. 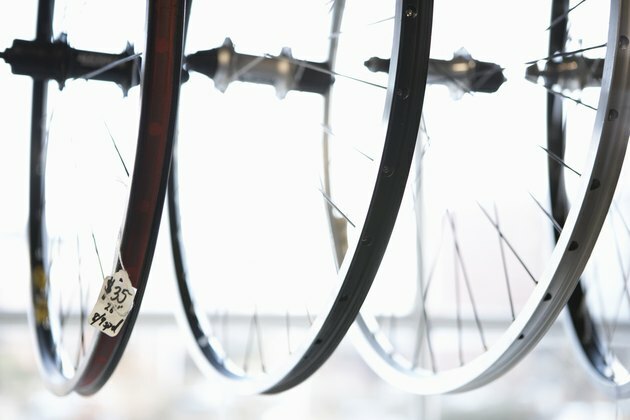 What Is the TPI on Bicycle Tires?